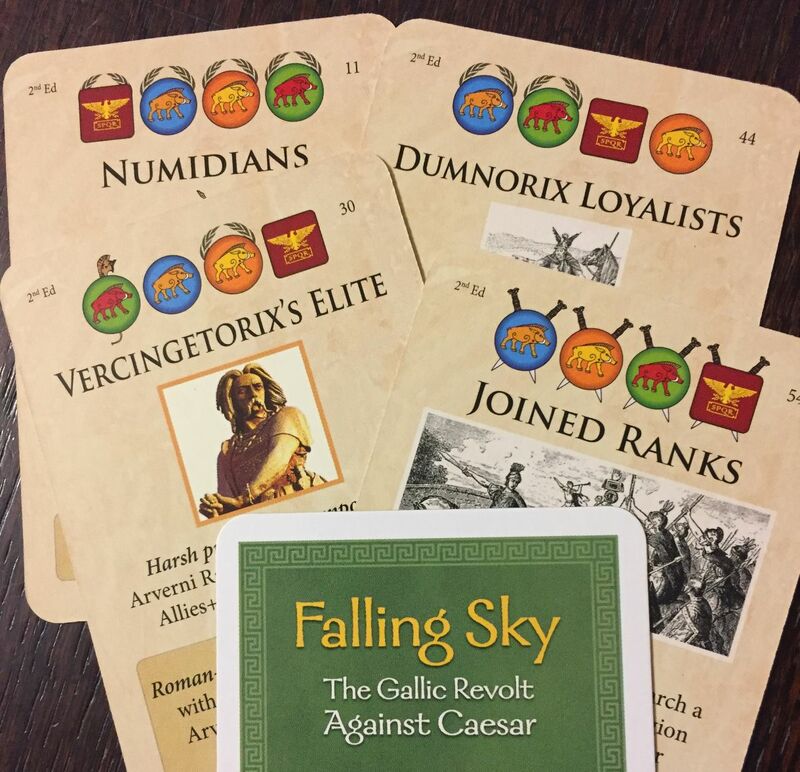 About game: This is a game about great gambit – or actually, the last stage of it – Caesar plans to conquer the Gaul and earns ever-lasting glory (plus political security 🙂 ) It depicts last chapters of that process – the most volatile period, as this is the time of the Great Revolt. In a base game we have possibility to see years 54-51 BC depicted in three nice scenarios, with an expansion bringing years 58-55 BC to the table. 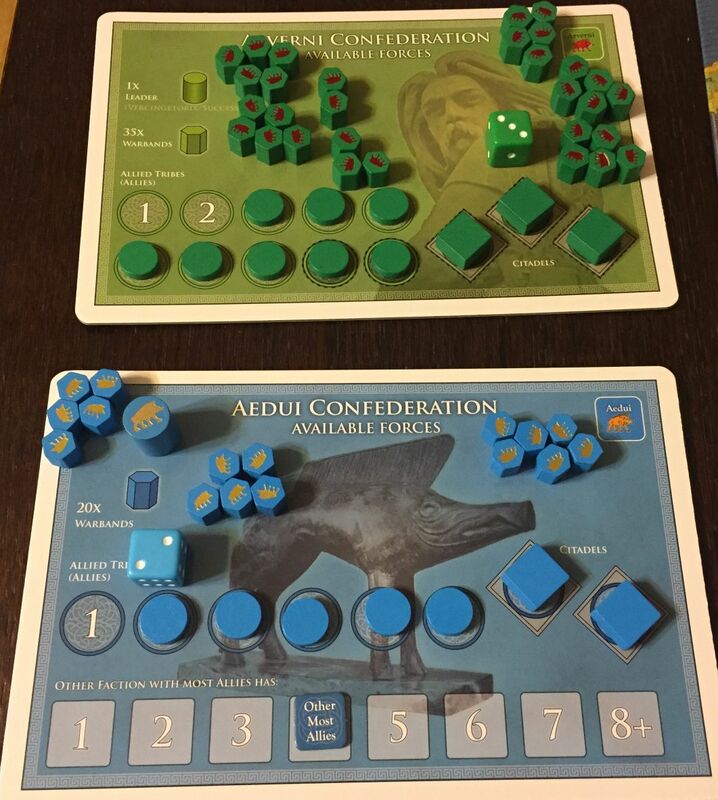 The game follows well proven COIN (COunter INsurgency) mechanic as well as its concept – we have ever-powerful Rome (Caesar), strong but weaker direct opponents (Arverni, Belgae, Germans) and humble, but playing their own agenda Aedui. Who will outsmart others? Who will betray Allies in the best moment and turn against them? And who will be smart enough to keep their friends close but enemies even closer? These are the question which The Falling Sky – Gallic Revolt answers very well! Number of players: 1-4 – four is perfect – if you can get enough friends to play. But version for 1-3 is also very well scripted and definitely COIN games are one of the best suited for solitaire play. Playing time: We have here a bunch of scenarios, with base game bringing three and Ariovistus expansion another two (if you count The Gallic War one). Some of them also have shorter versions, so it can be anything from 2 to 8 hours, with an experience significantly decreasing the amount of time needed. So yes, this is definitely game you can play in one evening, especially shorter set-ups. Complexity: The basic rules are pretty straightforward and easy to learn. It is nuances – in abbreviated text or special exceptions – which might made you reach for rulebook pretty often in the beginning. The Player’s Aid’s are very helpful, but I will still rate this as medium-complex wargame. Climate – as you can see based on games I play, my avatar/log and session reports – I am a fan of Ancient History. And that game really well depicts the time of Gallic Conquest! We have multiple scenarios which portraits various stages of Gallic Revolt plus great expansion – Ariovistus. With many scenarios comes also replayability – this is also thanks to ever changing deck of events. I like the asymmetric factions – there are some similarities, but each fraction is very different and the usual COIN dynamic – with hegemon and “insurgents” – is very neatly implemented. Different victory conditions – definitely, this is great enhancement to the game. Also, the levels of points needed to reach automatic victory are set in a way that there is no possibility of “winning by chance”. While in longer scenarios (like 54 BC and The Gallic War) we are sure to use all or almost all cards, in shorter ones this can be only a fraction of available events. And it can happen, that this makes the game unbalanced towards one or the other side. I would rather see more balanced deck for shorter games. Belgae in 52 scenario – well, just look at the Belgae situation. It is historical but gives few options for victory. On the other hand, this is a faction I am playing when teaching new players – short scenario, and I can just stay aside from main event. The Gallic War switch from Germans to Arverni – yes, I know it has to happen, that is how decks are built. Still, this is not my favorite feature of the game. All the nuances to the rules, abbreviations, commas, and’s, or’s, etc. I feel sometimes the form is more important then the merit. For whom? Of course, first and foremost for COIN series fans – truly, this is in my opinion definitely the best usage of the system. Yes, I am biased to ancient history, but the way it was adopted for that time is great. All wargamers who like medium-complex games, with some aspect of economy and fight will find that game very appealing. While not the easiest of COIN games, I still think and recommend it also for gamers who would like to learn COIN system – this is the best adaptation for me, which can be used as hallmark. And now let us have a look at the components – all pictures from my session reports. The Falling Sky + Ariovistus expansion is a complete game. It has all the aspects I require from a wargame – climate, fight, interesting capabilities, replayability, suspense, well incorporated random factor, etc. And despite some drawbacks (in my humble opinion) this is a superb and well made game. See you in another game review! PS. Following Lucius Cornelius Sulla, a real example from whom Caesar draw, can you really be The Best Friend and The Worst Enemy to your opponents?